At ECPR, our video strategist is equipped with a diverse team of videographers and the latest tools available to help our clients tell their stories. 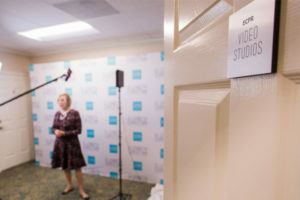 When our clients are concerned that media may not cover an important press conference or event, we help develop a backup plan by capturing the event with video footage, distributing it to local media and sharing it on the web. When clients are looking for ways to enhance their digital presence, we help them discover how video can tell their stories directly to an audience without the filter of a news station. With your company or organization’s website and social media channels, you already have powerful methods of distribution. You just need compelling content to tell your story–and video is one of the most powerful tools you can use. In today’s world, excellent video production is about more than making you or your CEO look terrific on camera. It’s about creating a consistent message that resonates with your target audience and finding the appropriate channel to disseminate that message. At ECPR, we work with clients to utilize video as an effective way to tell their stories and build their businesses. Texas Mutual Insurance Company, the state’s leading provider of workers’ compensation insurance, frequently retains ECPR to produce high-quality videos that tell the stories of injured workers who have reclaimed their lives.